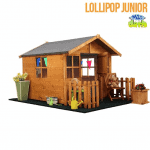 This fun playhouse is the perfect size to amuse your children or grandchildren without taking up too much space on your property. One of the things we really liked about is that it’s based on two levels, taking on the appeal of a treehouse, and giving your little ones a shaded area underneath that they can use as a den. You’ll need to supervise them of course because of the raised level, but you’ll love seeing just how much they enjoy themselves. One of the value adding features of this playhouse is that it has a fixed window, as well as a glazed door, that allows the children to look out on the world as they stay safe and dry in the playhouse. There’s no need to worry about the strength or security of the window either, as it features styrene glazing which is very tough and shatter resistant. With safety so important in a playhouse this was really good to see, as is the fact that this meets the stringent BS5665 and EN71 safety standards. The door to the playhouse is big enough for primary age children to get through without any difficulties, and it also features a magnetic catch that keeps the door closed until it’s pushed. That means you won’t have to worry about the door banging to and fro in windy conditions, and we think it’s a neat touch. 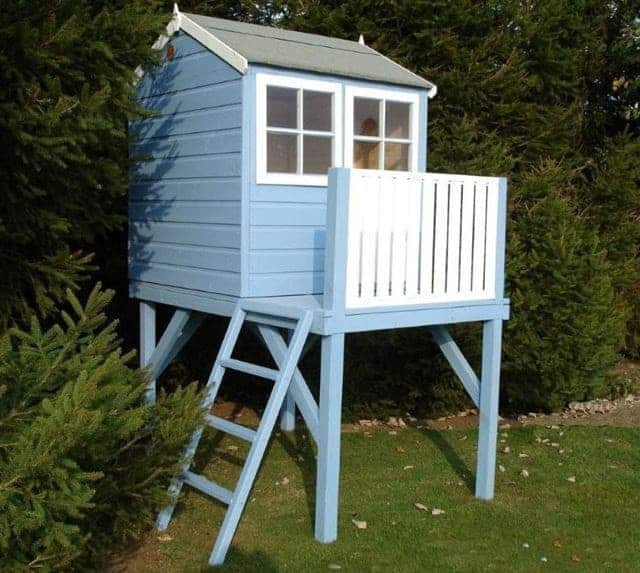 We liked the look of this playhouse at first sight, so we can imagine how appealing it must appear to young eyes. Made by garden building experts Shire we also had high hopes for the components and design of the playhouse, and thankfully these were borne out as we conducted the review. Whether you have one, two, or more children or grandchildren, there’s more than enough space to occupy them. 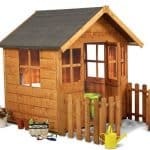 The peak height of this playhouse, at the ridge of its felt covered apex roof, is 2.40m and the eaves height is 2.04m. The width is 1.19m and the base is 1.74m, but when choosing a site on which to place it you’ll need an area of 1.19 X 1.82m to allow for the overhang. 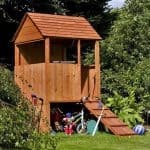 One of the things that makes this playhouse so versatile is that it features two distinct levels. The upper level consists of the playhouse itself that’s accessed via a secure wooden ladder. It’s an enclosed area with good weather protection, so is perfect for a drizzly day, and it also features an attractive verandah area for when the sun shines. Underneath the platform is an open area boarded by four timber struts, and we can easily imagine this being used as a den. We were pleased to see that tongue and groove cladding had been used throughout this playhouse, as its tightly interlocking boards are very good at stopping water penetration. The apex roof also helps with this function by channeling rainwater away, and the end result is a reliably dry interior. It’s thickness of 12mm is also welcome, as this is as thick as we see on many high end timber sheds and workshops. Even more pleasing is that the floor is thicker than the walls, which is not something that we usually see. Even though it’s made out of solid board material, it has a thickness of 19mm, which gives it a heavy duty performance and durability. 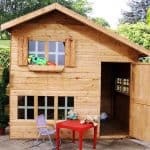 With such good quality cladding used, and the rain repelling properties of the apex roof, we would expect this to be a very long lasting playhouse. Unfortunately, however, only a basic one year warranty against rot has been provided. The reason for this is that the timber has only had a basic dip treatment of wood preserver which gives a relatively short period of protection. Another effect of this is that the customer is required to treat the shed themselves with wood preserver not only on an annual basis, but also within three months of it being assembled. We feel this could have been avoided with the use of an initial pressure treatment, but we appreciate that this might have added to the cost. The door, which has an opening width of 0.51m and an opening height of 0.95m, is situated at the far end of the verandah, and what we liked most about it is that it has a magnetic latch. This means that it can be shut and secured easily, even by young children, and yet there’s no danger of them locking themselves in accidentally. There’s no secure locking system included, so be careful not to leave any items of value inside overnight. We were pleased to see that the window was opening, as this allows lots of fresh air in on a warm day, but even more importantly it features styrene glazing. That means you won’t have to worry about it shattering if it’s accidentally struck by flying toys. Another feature we appreciated is that there’s an option to add a window box in which you can plant some flowers with the children’s help. The use of styrene glazing is a sign that health and safety has been taken seriously by the manufacturer, as it always should be of course. We were glad to see that it met both British and European safety standards, and we know that parents will be pleased to see that as well. The picture shows the playhouse decorated in a very attractive blue and white colour scheme, but it’s supplied in its natural brown colour. That gives the owners a chance to have a talk with their children and paint it in a colour of their choice. In effect it’s a blank canvas on which the kids can express their creativity, although the outdoor paint itself will have to be sourced and purchased separately. One optional extra that can be bought with the playhouse is a set of boules. If you’ve never played the game of boules before, it’s easy to pick up and lots of fun for all ages. We can picture it being played in a sandpit that’s been placed to the side of the playhouse or even in the area underneath it. The high quality shiplap tongue and groove cladding on the walls, and the thicker than average floor, show the attention paid to quality. If the treatment schedule is adhered to, this could be a very durable playhouse, but if not then durability could be compromised. We’ve reviewed playhouses that are bigger than this, but we like the fact that another play area has been created by raising the playhouse. You’ll need a friend’s help to complete the assembly, but it can then be finished in around five hours. 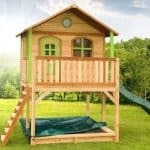 Three hundred pounds is a significant purchase, but this is a high quality playhouse and we feel that little ones will really enjoy letting their imaginations run wild inside it. 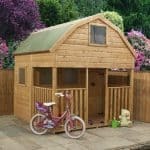 Final Thoughts: If you have children or grandchildren who love to run and play in the garden, then adding this good value playhouse can take their fun to a whole new level. It’s easy to assemble, and once it’s up you’ll have the reassurance of knowing that it complies to the very highest safety standards. The use of styrene glazing is one indication of this, and while it looks the same as normal glass it’s much tougher and more resilient. As we all know, that’s a prerequisite for anything that lively young children are going to be around. It will need treating every year, but if you don’t mind that then we feel this is a playhouse that’s well worth considering.